Like what I said in my contact page, I'm not a snob. Chos. But yes, I welcome your questions about motherhood, marriage or anything under the sun (or moon), if you have. I don't claim to be an expert on these things but I will do my best to answer it. So there's one momma who messaged me on Facebook today, asking for some advice. Itago na lang natin siya sa pangalang "Mommy Ganda". Her message was edited for brevity and clarity. 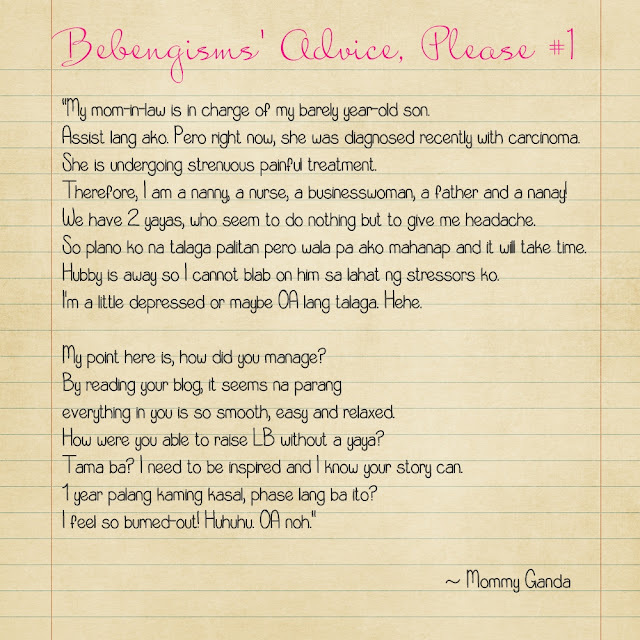 First and foremost, Mommy Ganda, you are not OA. Your problem story is very normal among us moms. Second, whatever you read here in my blog is just a quark of what really happens in my everyday life as a stay-at-home mom. Smooth and relaxed? That's not us. There are shouting bouts, LB makes dabog when going up the stairs (I know, it's pang teenager and it really makes me gigil-mad whenever she does it), and there are times when I just don't want to take care of her because I'm so tired. So I just let her watch TV for more than an hour. With your situation, I feel I can't relate much because I never experienced being a real businesswoman. Also, I haven't fully taken care of my MIL much as she has three daughters who could. But yes, I felt how bad it was to have two strangers in the house who are just pain in the neck. Also, my daughter is already 4 years old now so she's easier to take care of than your child. But let me ask you, what is your top priority? Sometimes, in our journey, we thought that we can do all that life had offered us; that we actually want to accomplish more than we can. Why not lessen the roles you play? How about taking a time off from the biz then get rid of the yayas, one by one? Hire a new one when you made one leave. Make sure you have trained them well. As for your MIL, ask help from her relatives. If you need to pay for their service, just so they will help you, do so without guilt. Always bear in mind that you're doing your husband a favor. What I feel needs your attention most is your son. Don't you think? He can't make milk on his own. If you think it'll stress your husband when you tell him all about these, then don't tell. And when you think things are getting better, it's time to talk things over with him. Ask him what he thinks about it. For me kasi, whenever I have domestic issues, despite my husband being away, I consult him no matter what. I want him to get involved. But if it's too petty, I save him from the burden. Kidding aside, life is what you make it. When Rhambo and I fight, I used to always think maghihiwalay na kami. When LB throws tantrums, I used to always want to go back to work just to get away. But now that I've learned to look at how blessed I am to have a husband, who may be an a-hole at times, but is faithful and honest; I know I can't live without him. Being a SAHM is something not all moms can manage; not because of its financial strain to the family's income, but the duties and obligations one has to entail with. I'm blessed to become one. I'm with my daughter every minute she needs me. I witness her every move that I can bring with me when I get gray and old. Feel blessed that you can hire and pay two nannies. Feel blessed that you are strong and healthy to take care of your MIL. Feel blessed you're with your son, unlike your husband who's always away to work. So, I hope medyo nakatulong ako. I have to agree, maybe the best thing to do is to lessen her duties so she can focus more on her son. :) And I also agree, some moms may seem like they have perfect lives -- 'wag mainggit kasi most of the time, hindi naman nila pinapakita yung unglamorous part of their lives hehe. A few months ago naalala ko sinasabi ko rin na buti pa si ganun, si ganyan hindi haggard. That only made me even more depressed. I just saw this poem sa FB. I don't know but napapaisip ako after reading this whenever I complain na meron kulang/problema sa buhay ko. Hope it helps a little.